Mary Mascari | Writer. Geek. Mom. Tired. 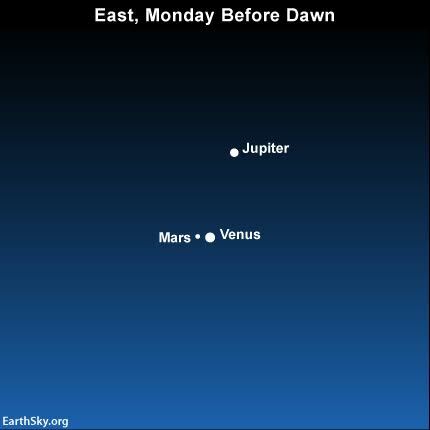 My husband came in from his early-morning constitutional and asked, “Do you have a moment?” He wanted to show me the planets in the sky before the sun came up. Pulling a hat over my still-wet hair, I went out to the backyard and saw three spots of light; one very bright, one less so, and the dimmest with a reddish tint. Three planets. If there’s a clear morning where you live in the next week, get out and see this convergence. (Apparently, Mercury is visible down near the horizon, but there were too many houses in the way for us). Jupiter is 628,743,036 km away from Earth. I couldn’t flip my mind to see it as very far away, instead of very small. It was probably a quality of the light and the way our eyes work, but I could get philosophical, too, and say that it’s difficult to not see everything as close up. About us. It’s not a gas giant ten times the size of Earth, it’s a pinprick of light a few miles up. It’s so easy to forget that we’re just a Pale Blue Dot, but when I remember to think about it, I find it very comforting. None of this matters quite so much as we think, so we might as well be happy. 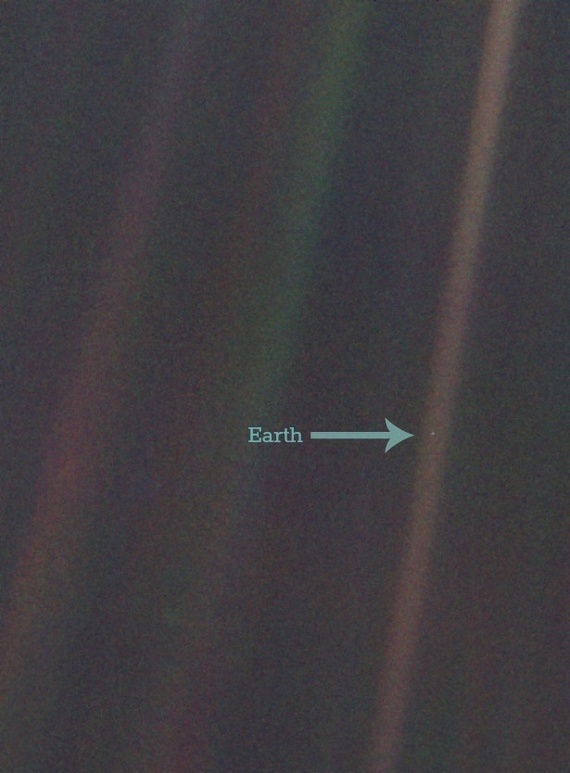 Earth, as seen from Voyager 1 as it looked back before leaving the solar system. “That’s it. That’s us.” – Carl Sagan. On Wednesday, I took the afternoon off from the day job and took my kids to the pool. We were there for four hours, and fully enjoyed the warm weather. It’s a good thing we jumped on that, because it’s cold and rainy now, and won’t be warm again for a while. I get a little pathological about truly experiencing the weather in the summer. If it’s nice out, I feel guilty about being inside. It’s like there’s this rule that says GO OUTSIDE IT’S NICE OUT. But when I get out there, I’m like NOW WHAT? I usually just sit in the shade and read. I figure that’s good enough. The Table of Contents for Selfies From the End of the World, the anthology from Mad Scientist Journal that will be featuring one of my short stories, has been released. Check out the list of stories and authors. It looks pretty cool! One of my favorite shows went off the air last month: The Late Late Show with Craig Ferguson. The final show opened with the above video. if you haven’t seen it, take a look, even if you don’t know the show. The song is “Bang your Drum” by Dead Men Fall, a Scottish group. I was crying by the end of it. I just found the whole thing so inspiring. Craig kind of stands for success in my head; I’d always hoped to be famous enough to be on his show someday. Now that won’t happen, since the show is off the air, and I doubt Craig will do a talk show again. A few years ago, this video and song would have sent me into a tizzy for weeks. I’d’ve been full of inspiration, but would have nowhere to use it. I’d feel the call, but didn’t know how to answer. Bang your drum, they say, but how? I used to be an actor. I had pretty good instincts, and that’s what I was going to do to become famous. I wasn’t successful for many reasons: it’s bloody hard, I wasn’t really motivated, and the lifestyle didn’t suit (I liked standup comedy, but I go to bed at 9:00, am allergic to cigarette smoke, and don’t like being away from home for long periods of time). It all boils down to me not working very hard at it, but that’s sort of a circular logic: I didn’t work hard because I didn’t like it because I wasn’t good at it and around and around. Happy ending, though: I found writing and dedicated myself to it about ten years ago or so. I’ve written two novels and piles of short stories. I’m pursuing an MFA in Writing Popular Fiction. I can work at home, early in the morning. Although I’m not published yet, I know I will be eventually, and in the meantime, I just keep getting up in the morning, pouring myself a cup of chai, and banging my drum. Anyway, the point of this story is that you should, indeed, bang your drum. But make sure it’s your drum, and don’t worry if your drum is good enough or not. The banging is what’s important. I’m currently enrolled in the Writing Popular Fiction MFA program at Seton Hill University, which is awesome and wonderful and I love it. A big part of the program are these biannual, 5-day long residencies, where we go onto campus and stuff our brains full of writing information, inspiration, fun, and caffeine. 1. It’s not as cold in Pittsburgh as it is in Chicago, but close. 2. Don’t chase trends, or write to a formula, but do give readers and editors some familiar ground to start from, the basic chord progression, and from there, innovate and riff like crazy. 3. Start promoting yourself even before you’re published, because once you have a contract, you’re going to be super busy. Like super busy. I’m a little nervous about that. 4. There are surprises in Star Wars and Empire Strikes Back for someone who has never seen it before. Also, it’s really fun to watch someone watch those movies for the first time. (also also, I need to memorize the Greedo and Jabba scenes so I can translate better next time the subtitles don’t work). Of course, there was more than that, but my brain hasn’t recongealed yet. Now if you’ll excuse me, I’m going to fall asleep face-down in my dinner. I’m in a conversation with my mentor about whether my thesis is Science Fiction-y enough, which got me thinking about the difference between the two genres. In my mind, the (probably oversimplified) difference is that while the cool speculative stuff in fantasy is caused by magic, in SF it’s caused by science or technology. But when I’m writing, I find I’m drawn to Science Fiction, and I think the reason is that technology is accessible to me, whereas magic, obviously, isn’t. It’s like in the Dragonriders of Pern series, where it started out as a pure fantasy, but then we learn that the dragons are genetically engineered** and that was awesome. That means I could get a dragon! Science Fiction sometimes comes to pass. Fantasy generally doesn’t. So I like taking those fantasy elements that inspire me and finding ways to make them feasible. That said, I’m now looking at my thesis to see if I might make it straight fantasy. So there’s that. *Don’t get me wrong; I read a ton of SF, too. And literary fiction, for that matter. **It’s not a spoiler if the book came out over twenty years ago. Our city does official Trick or Treating on the Sunday before Halloween every year. In some ways, it’s definitely a better choice: there’s no hurrying home from work, it’s all during daylight hours, and the kids are in bed–albeit sugared up–on time. But there are a few down sides, too. For one thing, my kids don’t get that spooky experience of being out in the dark in your costume, certain that real spirits are floating around, and only your costume is keeping you safe. When my brother and I were kids, we’d always do one round right after school, and then another one after dinner when my dad got home from work. We must have been out for hours. We always came home with pillowcases literally full of candy. My kids were done trick or treating by 3:00 in the afternoon, and although we watched The Great Pumpkin, there was no special, spooky feeling. The other problem with having Halloween on Sunday is that it feels like it’s over already. Many years ago, we attempted to balance our different family Christmas schedule by holding our own Christmas morning a few days early, before we all scattered to our other families for actual Christmas. We woke up and exchanged presents in our pajamas*, just as if it were December 25. But when we went out for brunch afterwards, we were all surprised when no one else was as full of Christmas spirit as we were. Of course, for them, it was December 22 or whatever. I’m doing something similar now with Halloween. I keep having to remind myself that Halloween isn’t over yet. After all, the boys have two more Halloween parties this week. I just have to resist taking down my ghost luminaries until the weekend. *Except my brother, who has always insisted on showering and dressing before opening presents. I’m certain he started this habit just to vex me when I was impatient to start opening presents. Find other places to enjoy Mary-ness, such as Twitter, Google+, and LinkedIn.